The Washington Post Book World has called Adam Haslett “our F. Scott Fitzgerald,” and his newest book, Union Atlantic, a “profound, strikingly intelligent story.” Its themes - financial power, tradition, and the distortion of desire these forces create, paint a masterful portrait of our gilded age. Haslett’s earlier short story collection, You Are Not a Stranger Here, was a bestseller and a finalist for both the Pulitzer Prize and National Book Award. On Tuesday, March 1st at 7 pm, Book Passage in Corte Madera will be hosting a special event in which this acclaimed author will be in conversation with Bay Area writer Tom Barbash. 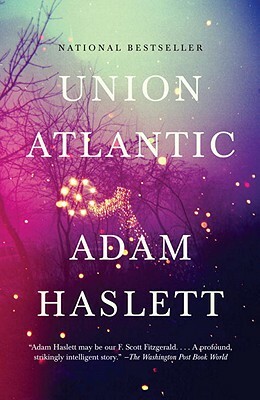 Adam Haslett spoke at Book Passage (before a large crowd) in 2010 when Union Atlantic was first published in hardcover, and now he returns to celebrate the softcover publication of his latest book. At the heart of Union Atlantic lies a test of wills between a retired history teacher, Charlotte Graves—who has suddenly begun to hear her two dogs speaking to her in the voices of Cotton Mather and Malcolm X—and an ambitious young banker, Doug Fanning, who is building an ostentatious mansion on what was once Charlotte’s family land. Drawn into the conflict is Nate Fuller, a troubled high-school student who stirs powerful emotions in both of them. What emerges is a riveting story of financial power, the defense of tradition, and the distortions of desire these forces create. With remarkable scope and precision, Union Atlantic delivers a striking vision of the violent, anxious world we’ve come to inhabit. Copies of Adam Haslett's Union Atlantic (Anchor, $15.00) and You Are Not a Stranger Here (Anchor, $14.00) are available through Book Passage, as are copies of Tom Barbash's The Last Good Chance (Picador, $16.00). Don't miss this very special event featuring two accomplished and acclaimed authors. Tom Barbash's celebrated novel, The Last Good Chance is highly recommended. Of it, Jonathan Franzen said, "Barbash brings fresh seriousness and sympathy and wit to bear on the ancient problem of loyalty. This is an ambitious, deftly plotted, multifariously satisfying piece of genuine American realism." We might also mention that TOM BARBASH was the winner of the California Book Award for his novel "The Last Good Chance." He is also the author of the New York Times bestseller "On Top of the World." And, his short fiction has appeared in Tin House, Story, The Virginia Quarterly Review and other publications.